Choosing the right office furniture can be a daunting task. With so much choice in the market today, it can be hard to know the difference between different styles and brands, as well as weighing up the benefits of each one. There are always new and innovative achievements in design within the industry. One such innovation - Standing desks - have continued to be a popular choice of office furniture and it's even been claimed that they enhance worker productivity. This coincides with numerous reports that sitting down for long periods of time at a desk can actually lead to major health problems. But are either of these true? If so, what would therefore be the best choice for your office environment? We have taken a look at some of the benefits of both standing and seated desks, and explored why you might choose one over the other. There are a number of reasons why a standing desk can be the perfect choice for your office environment. Firstly, you may be wondering, what is a standing desk? A standing desk or sit-stand desk is a desk conceived for writing or reading while standing or sitting on a high stool. During the 18th and 19th centuries, standing desks were popular in the homes and offices of the rich. One of the main reasons for incorporating a standing desk in the workplace is to increase productivity. There are some strong claims to support this because physiologically, standing relates the act of working to our brain. Sitting in a comfortable chair all day can have the opposite effect and creates the risk of comfortable complacency. A number of standing desks are also height adjustable so are easily adaptable to the workplace. They can be ideal if your workforce doesn't need to spend long periods of time at their desk or for shared space. A good example of this would be in a role that is more practical or within retail positions. The act of sitting at a desk often means people will take more time than they need to, but a standing desk can lead to better efficiency. Although it is often claimed that being seated for long periods of the day can lead to health problems such as diabetes, heart disease and obesity, there are also claims that standing for long periods of time is not good for you either. Increased amounts of standing can be dangerous for the circulatory system and uses more energy than staying seated. Health benefits aside, a seated desk can still be the best option for many workplaces. For people who spend most or all of their day at a desk, standing can be tiresome and irritating. With fantastic modern design and innovation in ergonomic office chairs, employees are able to experience better seated support for their back than ever before. Studies have also shown that a good ergonomic office chair can increase productivity in the workplace as well. 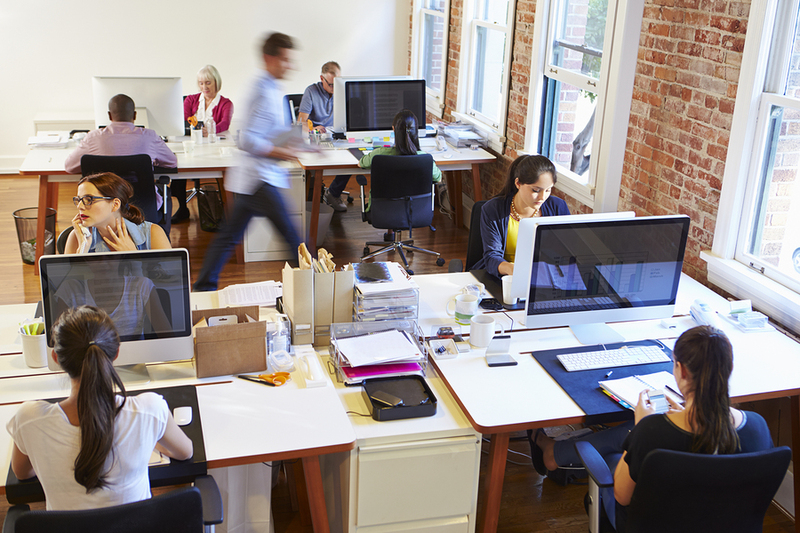 So with health risks associated with both and reasons why either one could increase productivity, are standing or seated desks better for the workplace? Well, the answer in short is that both of them can be, depending on your situation. Each offers different benefits depending on the type of working environment that you have. However, with the help of modern technology, it is possible to enjoy the best of both worlds. 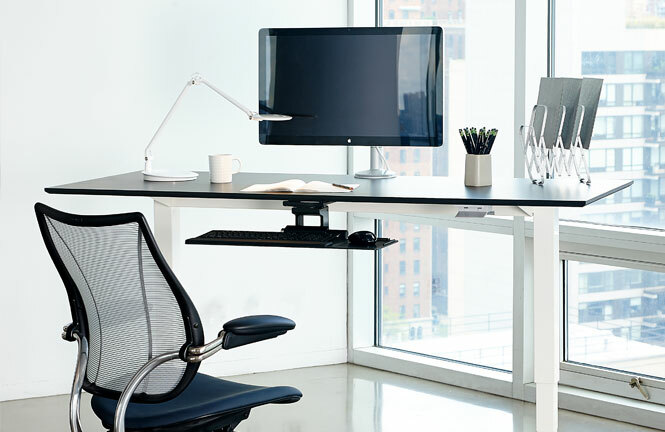 Modern standing desks can be easily lowered to regular desk height and offer great flexibility, the Humanscale Float Desk is just one example of this. Investing in a sit/stand desk means that if your employees do need to spend prolonged periods at a desk on certain days, they can raise and lower the desk as required. Whatever you decide is better, you will most likely need a good ergonomic office chair too. Even if this is just for your employees to take a break from standing for long periods, ergonomic office chairs can maintain good levels of productivity and ensure you avoid the health issues associated with long periods of sitting.